Former jailbird Jim Clayton never was much good at controlling his anger, nor minding his own business. So when he winds up in the tiny mountain town of Billings, Georgia, and witnesses a man attacking a teenage girl named Darlene, he can’t help but step in. Unfortunately for Jim, the man is the local Police Chief. And in Billings, the police don’t bother with jail for people who assault officers – no, outsiders such as Jim are taken up into the mountains and hunted like wild animals. Only this time, the hunters aren’t prepared for a tough ex-con whose will to survive is equal to their bloodlust. Nor a stranger with a most unusual possession – a human soul. A soul he’s desperate to sell; a curse he’s desperate to be free from. When Darlene buys the soul, unwittingly transferring the curse onto herself, Jim once again steps in to save her, discovering he must face the demons of his past to do so, while fighting to stay alive against the band of savage hunters. Torment, a supernatural thriller in the vein of First Blood, is my third novel and is a continuation of my 2004 short story, ‘The Cycle’. 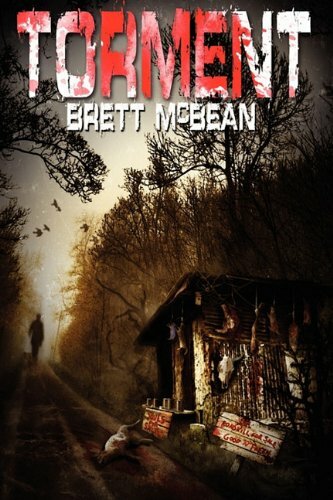 I’m one of your new fans from Germany and I’d like to tell you how much I enjoyed reading „Torment“. I read it in English though, since I feel that a lot of the original value gets lost in translation. Your way of writing is incredible. With very few words you’re able to create a massive suspense. The story gripped me right from the very start and I couldn’t wait to finish it. I really could picture the scenery with the woods and the cabin and everything. And the characters felt so real – sometimes you read something what could actually turn out to be a great book, but the characters remain flat and boring, without any authenticity to them. I don’t know how you do that, but it’s simply great. I grew up reading almost every book by Stephen King during my teenage years, and in the past 5 years I read everything by Laymon and Ketchum that I could find, so I guess that’s the reason amazon recommended your books to me one day and I was so intrigued by the plot that I simply had to buy Torment. And I didn’t regret it. God, I hope you never cease writing 🙂 seriously. Can’t wait to read your other books as well. I like your style, keep up the good work. PS: Btw I never knew you were a Laymon fan, but I had a strong hunch when I stumbled over the part with the book “the cellar” and was wondering the whole time whether or not you meant his book. Thanks so much for reading ‘Torment’ and for taking the time to write to me. Means a lot when readers let me know their thoughts of my work. Yes, I am a huge fan of Laymon. He’s my favourite writer; has been for around twenty years.